Results: 1 to 10 of a total of 197 results. Does captdana belong in this group? Shiver me scivvies! I would love to walk your plank. Arghhh from USPP-NY-11 Member of the USPP-NY. Pay is Rum! I'm Captain... Well! Erm! I'm not Captain exactly more of a 'spokesman' for a Rogue Anarcho-Dandiest-Submarine with a random crew that actually pops up in places, sometimes, when people with ideas and interesting dress sense turn up and join in! Does imothepixie belong in this group? Hey thar! 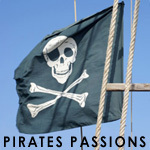 I like the clothes and the pirate talk and room temp rum! serious about that one.. lol umm im a nerd if you want to know anything else feel free to talk to me!